At this time of the year, I am either in Italy or France with my family and right now I tend to get nostalgic…it’s cold, foggy and windy in San Francisco, and I wish I were home. When I get homesick, I start cooking things I make when I am over there. 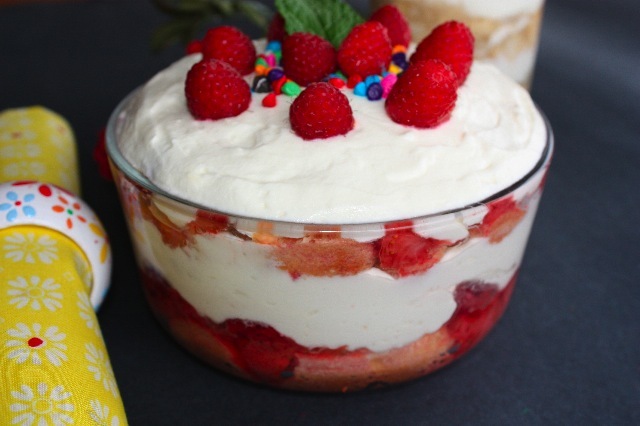 I love to use mascarpone in all kinds of desserts, it’s a wonderful cream, not sure I would call it cheese though, anyway it does not matter, what matters is all the wonderful recipes you can make with it. It’s certainly not to be snobby but if you get mascarpone, please try to get the imported one, not domestic. The domestic mascarpone is thicker, more yellow and more rubbery, so your mousse will not be as fluffy. I think when it has to do with tiramisù, I tend to be very “purist” in the sense that I hate to see tiramisù with whipped cream, I don’t know why it’s just one ingredient that I don’t want to see in tiramisù, therefore will not call this tiramisù, even if it looks like one. Yes, sometimes as far as food is concerned, I can be strange. 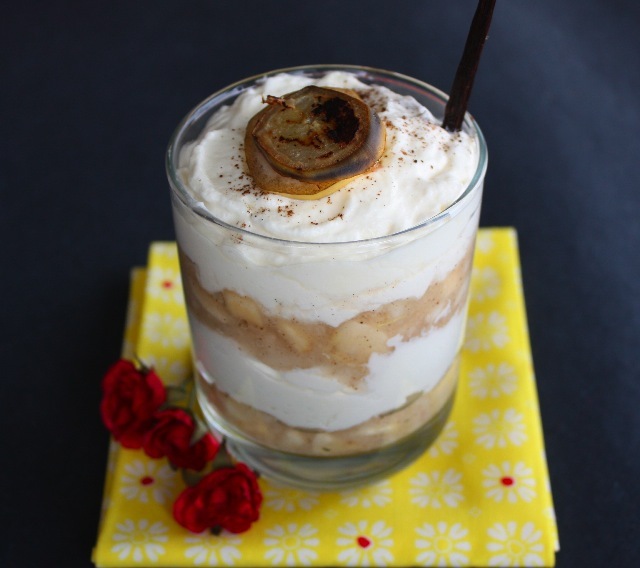 I had some extra mousse so I made an additional little verrine…banana, pear and vanilla. You can use any other fruit, but I just had those two left and the good thing is that they are two fruits that mix really well together. You can add some chocolate coulis after the layer of fruits. Wash and cut strawberries, add granulated sugar and cook at medium heat for about 15 minutes until the strawberries are cooked but not over mushy and that they have produced a deep red juice. Drain and keep the juice aside. Let cool. Add orange juice, marsala, and vanilla extract to strawberry juice, mix well. Separate yolks from whites. Beat yolks with powdered sugar until the mixture whitens and double its volume. Add mascarpone and mix thoroughly. Beat egg whites to a thick consistency, and until they start peaking. Fold carefully to the mascarpone mixture. Whip the cream and add to the egg/mascarpone mixture. Deep lady fingers in the strawberry juice. Deep long enough so that they absorb enough juice. Place at the bottom of a deep dish or a glass. Add a layer of cooked strawberries, then add fresh raspberries. Proceed with another layer of mascarpone cream, and start again with another layer of lady fingers, straberries, raspberries and cream. Decorate with fresh raspberries, and/or powdered chocolate or any other pretty item. Place in the refrigerator for 2 hours and serve. This entry was posted by silvia on August 22, 2009 at 8:13 am, and is filed under Desserts. Follow any responses to this post through RSS 2.0.You can leave a response or trackback from your own site. Sorry to hear that you are homesick, but you dish sounds scrumptious enough to cure any ill. Yes indeed, Mark Twain was so right. Thanks John! This is beautiful. 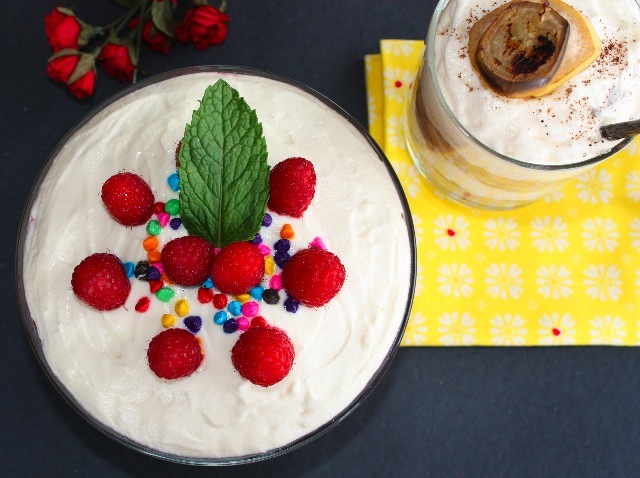 I lived in Italy so I know what you mean about mascarpone and about being homesick for Italy! This is a gorgeous dessert! My 21 year old son makes an outrageously fabulous traditional tiramisu and I beg for him to make it all the time! Thanks Jamie! don’t you think that getting the right ingredients makes all the difference? I use imported products when I make Italian or French cuisine and it tastes so much better. Enjoy the tiramisù! MMMmmmm, I love Tiramisu. This looks delicious even if it’s called something else. Thanks Andrea! doesn’t it? I made tiramisu once with the domestic mascarpone and I was very dissapointed with texture. At this point, we need some light in Sf, it’s so gloomy. Thanks Elizabeth! maybe I will call it the Somethingelse Cake!